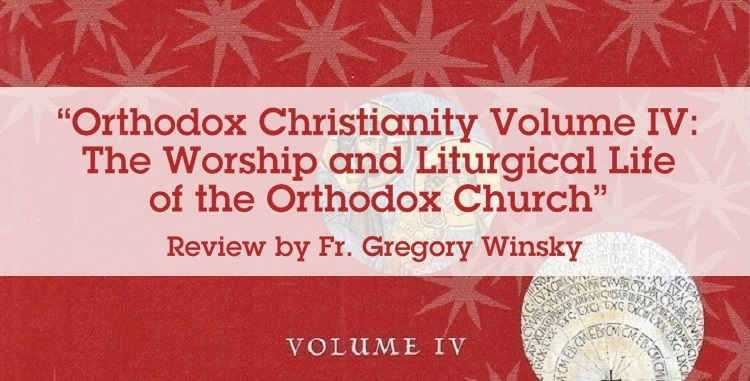 ORTHODOX CHRISTIANITY VOLUME IV: THE WORSHIP AND LITURGICAL LIFE OF THE ORTHODOX CHURCH. By Metropolitan Hilarion Alfeyev. Yonkers: St. Vladimir’s Seminary Press, 2016. 382 pp. ISBN-13: 978-0-88141-522-0. In this fourth volume of his encyclopedic work Orthodox Christianity, Metropolitan Hilarion (Alfeyev) of Volokolamsk has provided especially for us Orthodox Christians in America what just may be the most readable, comprehensive, and informative book on Orthodox worship services that has been published in the English language. True are the words on the back cover of this book: “Both beginners and experts can benefit from this examination of Orthodox worship and liturgical life.” Well said, and accurately put; this book, especially the one hundred page section on the Divine Liturgy, can easily be used as the basis for a series of weekly, or monthly, reading/discussion groups for Anglophone Orthodox Christians to better understand and more fully appreciate the Sunday service that we think we know so well. St. Vladimir’s Press, the publisher of many of Metropolitan Hilarion’s works, both written and musical, including Volumes I, II, and II of Orthodox Christianity, concisely states on its website: “The purpose of this series is to present Orthodox Christianity as an integrated theological and liturgical system, in which all elements are interconnected.” While the publisher’s point is well taken and quite true (“Volume I focused on the history and canonical structure of the Orthodox Church; Volume II on the fundamental teachings of the Church, grounded in Scripture and Tradition; Volume III on the unique aspects of Orthodox art as expressed in its architecture, icons, and liturgical music”), this latest volume, while fitting into that integrated whole, brings a special insight into our understanding of the services of the Orthodox Church, not just from a Russian or Greek perspective, but for us from what is a quite Western, read American, point of view. It’s not lost on the reader that Metropolitan Hilarion, who studied at Oxford under the guidance of Metropolitan Kallistos of Diokleia (then, Timothy Ware, author of the hugely popular English language book, The Orthodox Church, read by virtually every young cradle American Orthodox, as well as most American converts) when writing his doctoral thesis in the ‘90s on “St. Simeon the New Theologian and the Orthodox Tradition,” understands, having lived, the culture of both West and East, and writes prose that flows and elucidates, prose that resonates with Western readers. Volume IV is a tripartite text, divided basically into the Daily, Weekly, and Yearly cycles of Divine Services. A brief introduction focuses on general topics that touch all three cycles, such as language, hierarchial service peculiarities, and calendar. That introduction starts with this critical truism: “Worship is so important in the life of the Orthodox Church that many non-Orthodox Christians associate Orthodoxy mainly with liturgical services, singing, and icons.” In that sentence is the kernel of why this Volume IV strikes such a chord. In every section and subsection of this book, the engaging text brings out some new concept—whether from the history of how the services that we know today came to be, beginning in Apostolic times, through the Patristic era in that Christian empire centered in Constantinople, and thereafter as the fall of Byzantium resulted in the breaking apart into local Orthodox churches—whether from the writings of the Eastern (and some Western) Fathers—or whether through the prism of Tradition as it developed over the centuries—some new concept that we just had not heard, nor focused on previously. If, for no other reason, Chapter 3 on The Divine Liturgy in the section on the Daily Cycle of Worship Services is why one should read this book, a bright light in an array of shining lights in Volume IV. As the Preface says, “[s]pecial attention will be paid to the Divine Liturgy” and it is that special attention that underscores the point, as mentioned above, that reading and discussing these one hundred pages will go a long way toward making everyone’s understanding better, and perforce provide a better appreciation, of the Orthodox Eucharistic Service. Especially enlightening are the explanations of how and why the Divine Liturgies of St. John Chrysostom and St. Basil differ, critical grist for Orthodox based discussion and understanding, notably when Great Lent rolls around next year. It would be remiss of this writer not to note that Metropolitan Hilarion is a polymath; author of over 700 publications, including monographs on patristics, dogmatic theology, and church history; composer of many musical compositions, including a wonderful Divine Liturgy (available from SVS Press on CD that can be used by discussion groups focusing on those 100 pages as suggested above), an All-Night Vigil, and an oratorio, The Passion according to St. Matthew, for soloists, choir, and orchestra. Importantly, the Metropolitan is the Chairman of the Department for External Church Relations for the Moscow Patriarchate, in essence the senior diplomat of the Russian Orthodox Church, fluent in a panoply of Romance languages, in which many of his works have been published. While this review has employed the term “encyclopedic,” the Preface to Volume IV gainsays that usage, saying rather that all volumes taken together are intended to be “an attempt to understand Orthodoxy in all its diversity.” Yes, indeed that they are. But as Metropolitan Hilarion has been quoted many times in the past, the Orthodox Church has one reason for being: To provide for the salvation of the people. One’s reading of Volume IV is an effort that can provide great help to each of us as we strive toward our own salvation, toward theosis, toward life eternal. 1. Given that the translation times that resulted in the delays in publication of each volume of this work (Volume I © 2011 to Volume IV © 2016) we can probably expect to see Volume V from SVS Press next year. 2. The availability of that text in English kickstarted a discussion group that came to be the St. Innocent Orthodox Reading Society at our church. Father Gregory Winsky is a Russian Orthodox priest and cleric of St. Michael the Archangel Church in Philadelphia, Pennsylvania, a parish of the Patriarchal Parishes in the USA (Moscow Patriarchate). In addition to his ongoing practice of intellectual property law, Father Gregory is a professor at the Center for Orthodox Thought and Culture at Eastern University in St. Davids, Pennsylvania, teaching a course in Law and Justice in the Orthodox World. Metropolitan Hilarion is a genius, a true polymath. He runs the ecumenical relations of the MP, a daunting task, he is a loving man, who visited Rev. Billy Graham who had helped the Russian church catechize the public in the basic Gospel with a blessing from the MP , on the latter’s 99th birthday, and he is a brilliant composer; his St. Matthews Passion is exquisite, as are his careful reconstructions of medieval Russian chant (which I think are probably more accurate than the Pomortsy Old Believer recordings I have heard from Woodburn, Oregon, in that the latter, contrary to popular belief, is not completely frozen in the 17th century but is a tradition that develops just like the canonical tradition, a key difference being the lack of diaconal parts due to the Priestless status of that particular community). I love Metropolitan Hilarion. His Eminence is one of those loving bishops who when they celebrate the liturgy you have to resist the urge to hug them and thus disrupt the service and muss up their Omophorion. I think Metropolitan Hilarion loves all of us, too; he certainly prays for us every day in the divine office and when celebrating or attending the Divine Liturgy. 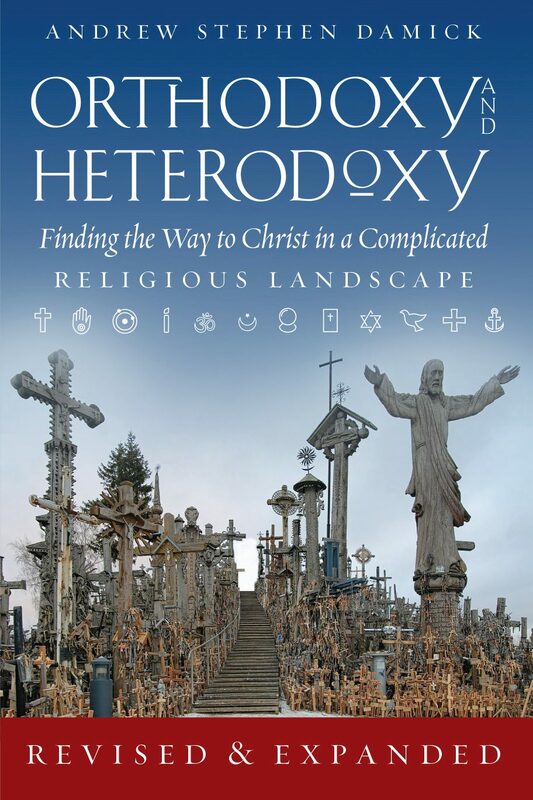 I am definitely getting this book, which looks like it will do for Liturgics what our host Fr. Andrew is doing for heresiology and apologetics with his newly revised book (which was epic; I can’t wait for a possible third revision). We have ancient works like De Sacramentiis and St. Cyril, and we have some very good works by Fr. Schmenann and others, but what is needed is a modern encyclopedic guide, and I think this book is probably going to do that. I am ordering my copy today. Many years to you, Fr Winsky, and many years to His Eminence Hilarion.